Register Log In ECN Forum Forums Photos for General Discussion Threadbare SE Cable - What are the Dangers? What would say the issues and/or dangers here are? I find this problem a lot and would appreciate some ammo for my arguments to replace such worn SE cable. "Oh, it's just a ground wire..."
The local fire department had such an SE cable that had corroded to the point that only a few strands of the neutral were still connected. Ironic isn't it? The biggest problem I've had with cables like this is that they are no longer raintight. Water wicks down the cable & frequently starts the lugs in the meter corroding. 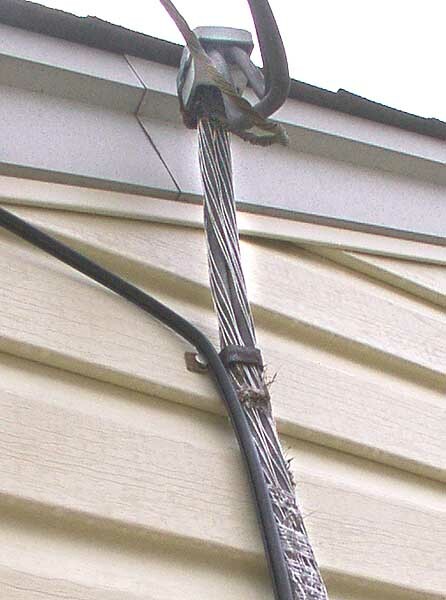 I've also seen it continue past the meter & go down the cable to the service disconnect in the basement & rot out the lugs there. What about possible shock hazards? Yeah, I've seen lots of discos with rotting CB's even with the SE intact and the proper raintite connector used... This is of course when the disco is directly below the MB. I can easily see where this would aggravate the existing sealing problems. these are everywhere ! the only thing missing is the semi-bare conductors out of the head, and the arc-welds from clacking together in the wind. i point this sort of disaster-in-progress out when on service calls, etc. i usually ask them to ask any local sparky for a 2nd opinion. As Tom pointed out, from what I see, one result of this condition is the entrance of water into the Meterpan which drips on the central Neutral lug an eventually rusts it away. If Panelboard is in Basement it gets water in it possibly damaging the Bus and/or Main Breaker. To most this would seem to be a shock or fire hazard ... is it? I would imagine fire would be the biggest concern if the neutral lug (or other connection of the neutral) allowed the infamous 240V series to smoke a few appliances. Ground reference may be lost in places with poor soil, and poor grounding. Someone in a panic to unplug said smoking appliances could be hurt by burn or electrocution. Its obvious that this service was installed a long time ago. And yes as the person that did the remodeling, siding, facier board trim. They most likely did not resecure the entrance cable. This however is a serious problem. Not to mention Shock, as well as damaging equiment ect. I think they should have some sort of inspection from time to time, especially in the older sections. I know that the inspection Department know that this type of thing is going on. They condem building for safty reasons ect. I beleive a lot of the problems we have exisiting today is because of lack of concern. Can someone explain the shock hazard to me. I don't doubt that there is one. I just don't understand the theory behind it. The grounded neutral is also bonded to the ground rod which is driven in the earth. Wouldn't it be the same as a person touching the bare #6 awg grounding electrode conductor which is installed from the service panelboard to the ground rod? There is no shock hazard with that example.